The Breakdown: What Are Derivatives? The Senate recently defeated an attempt to weaken crucial regulations on derivatives. Why and how should derivatives be regulated? Are you confused about derivatives? You're not alone! On this week's The Breakdown, Editor Chris Hayes speaks with CFTC Commissioner Bart Chilton about the role of derivatives in our economy. Derivatives, derivatives, derivatives! Throughout the financial crisis, the word derivatives has popped up in every corner, every hearing, every news broadcast related to the crash. Yet, they remain one aspect of the crisis shrouded in mystery; they are under-explained, difficult to comprehend and maligned by many. This week, the Senate defeated an amendment to the financial regulation package that would have weakened its controversial, but crucial derivatives language. But what are these derivatives, and why is it so important they be regulated? 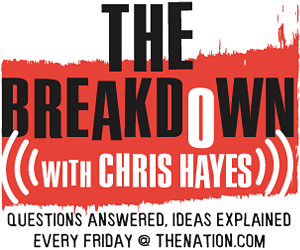 On this week’s edition of The Breakdown, DC Editor Christopher Hayes asks Commissioner Bart Chilton of the Commodity Future’s Trading Commission to delve into this devious derivatives market. More information on our guest and the CFTC. Senate Rejects GOP derivatives plan (via Politico).